Some days are simply filled with fun and frolics. Some days are filled with work, work, work. Today was neither. We couldn’t decide whether to go to Stirling or Glasgow today. Instead, we settled for Cumbersheugh. We didn’t need much, but we did need some shopping. Not ‘messages’, but ‘shopping’ there’s a difference, but much too subtle to try to explain here. After the shopping was completed successfully, we came home to rest from our labours before heading out to Milano’s for lunch. Started was Pollo Fritto for both of us and Pizza for me, Pollo a la Fiorintina for Scamp. Because she was driving, I had a half pint of Tennents. My food was fine, but Scamp’s rice was decidedly stodgy, almost like sticky rice. After we got back I went for a walk to Condorrat with a slight detour round St Mo’s. 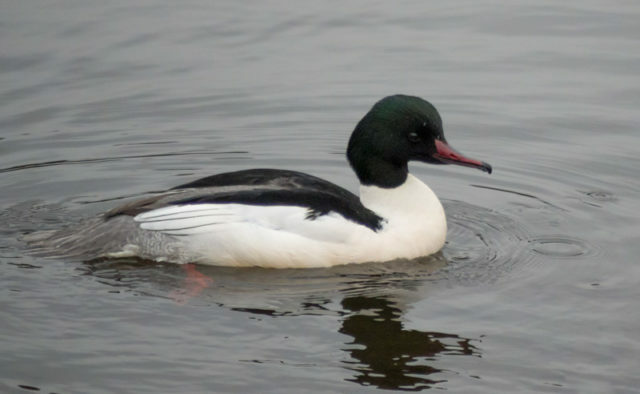 Spotted a male goosander in among the tufted ducks and the mallards. Managed a few shots of it and it became PoD, even although the shot was taken at a fairly high ISO rating. Dull day, and when I was coming back, all the cars had their lights on. Such a difference yesterday’s sunshine. It was cold too. Spring one day, winter the next. Tomorrow it might be summer! Well, there’s always a chance with the spring equinox.